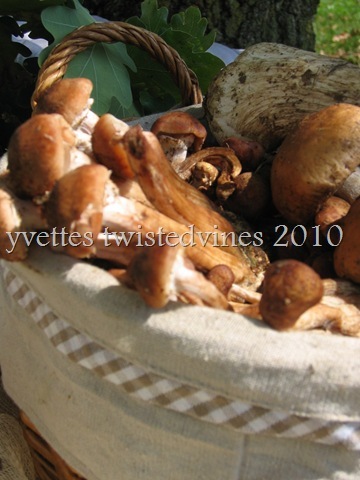 The perfume of mushrooms open the Autumn season, as does the season for mushroom hunting through the forest. Rising early morning, with a slight chill in the air, old jeans and long sleeve shirt, boots and double socks, walking stick and woolen cap, ready are those who go on Sunday’s morning stroll in search of mushrooms. Dampness, moss, old leaves and abandoned tree trunks, the perfect undergrowth of the forests environment to find these wonders. Italians call Porcini mushrooms “un trionfo di bosco” meaning the triumph of the forest. Porcini mushrooms fresh with their flavour, perfume and meat-like texture are just an exquisite and overwhelming flavorsome mushroom. 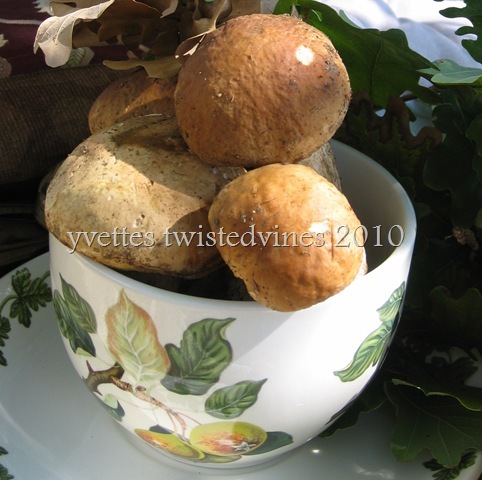 These large capped mushrooms are also easily found in dried form available in supermarkets. Dried Porcini with their concentrated flavour and aroma can be added to risotto, sauces and soups. A few facts about Porcini mushrooms.How do know the best of the best for their freshness? Signs of aging are if the undersides of the caps have a yellowish-brown tinge, the mushrooms are over-ripe. Best those ones leave behind. Never clean fresh porcini by soaking in water…shake of excess soil around the stem, and undersides of cap then with a damp cloth gently clean the cap of the mushroom. Porcini are also delicious sliced, grilled with a drizzle of olive oil and parsley, nothing fancy just pure flavour. Porcini are also made into delicious sauces for fresh pasta: pappardelle (thick ribbon pasta) with porcini and pecorino (a strong goats milk cheese) penne with porcini and speck (cured meat) pasta shells with spinach, porcini and creamy white sauce. Risotto with porcini both fresh and dried is one of my favourites. Risotto is one of those dishes you’ll always find on menu’s in Italian restaurants, and usually made with the seasonal vegetables. At the moment pumpkin or mushrooms are on the menu. For this recipe I used a mix of fresh porcini and chiodini mushrooms and also for added flavour dried porcini. Firstly steep the dried mushrooms in a small bowl with tepid water for about 15 minutes.Clean the two types of mushrooms with a damp cloth making sure the stems and caps are clean of any soil.Slice thinly. Strain the dried mushrooms, keeping the flavoured water, and it can be used later in the cooking process. Break these now soften mushrooms with your fingers into strips and combine with the other mushrooms. In a heavy base pan, melt 3 tablespoons of butter and 1 tablespoon of olive oil. Add the peeled garlic cloves combine with 2 tablespoons of finely chopped parsley.After this is heated through for a few minutes take out the garlic. At this point add the rice,toast within the melted butter mix for 4 to 5 minutes. Stirring continuously. On the side have the hot broth ready..never add cold water to the cooking rice as this stops the cooking process.Add firstly the white wine, a few ladles of broth and the kept mushroom flavoured water. Until the rice is just covered. Stir continuously with a wooden spoon. At the half way mark of cooking time of the rice,add the mixed mushrooms,salt and pepper. Continue stirring .Cook the rice until slightly “al dente” take off the flame. Add 1 tablespoon of mascarpone, parmigiano cheese , leave resting for a few minutes before serving . 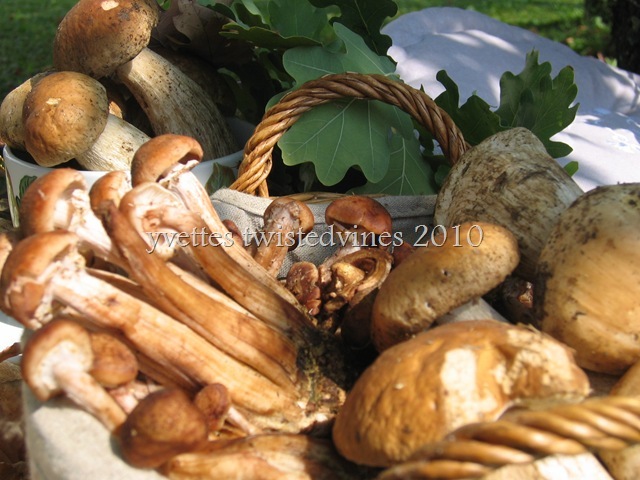 We love mushrooms and used to hunt for Morels in the woods when we lived in Southeastern Michigan. Your recipe for Risotto looks fabulous. I like risotto. My brother cooks it often. 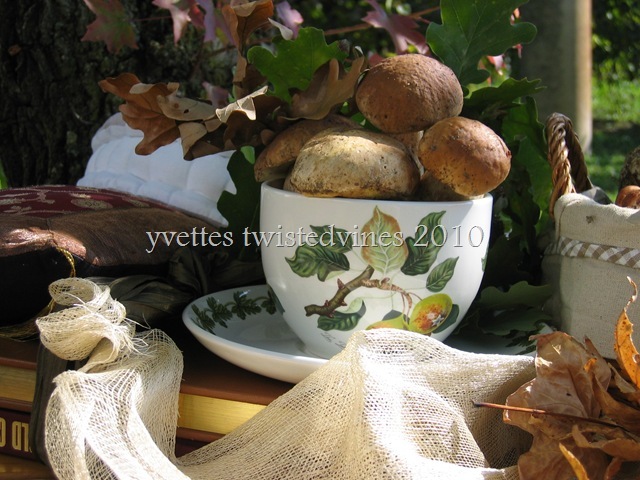 Thank you for sharing your recipe and the beautiful photos of mushrooms and all the autumn colors and the many accessories that make your post so attractive. Thanks Carol, I made this risotto last weekend for friends…and in the end it was all eaten and not a photo of the dish in sight…memory lapse…however the night went off well great friends ,risotto and wine, life and laughter! I was recently lamenting the lack of fresh porcinis my area of the American Midwest. (I’ve been making do with dried.) We do have fantastic morels in springtime, though. It’s wonderful to read about your adventures and the wonderful local produce available to you in Italy — keep up the great sharing!